This beautiful Black Rocking Horse makes the perfect addition to any child’s playroom or bedroom. The solid wood rockers of this classic toy nod to tradition, while the soft plush body gives the Black Rocking Horse a realistic finish. Kids can brush the long white hair of the mane and tail—this adorable horse even has fluffy white socks! Unlike a traditional rocking horse, this contemporary model neighs when children squeeze its ears! Realistic horse noises add to the role play fun as kids play at horse riding and grooming. 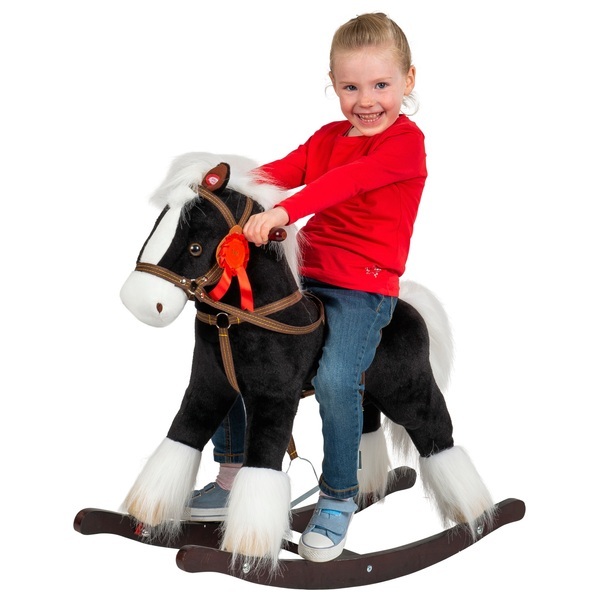 The Black Rocking Horse features a soft padded saddle with wide stirrups and wooden hand grips so kids can rock in comfort. A spiralling design on the saddle and a prize rosette on the reins add the perfect finishing details to this beautiful plush rocking horse. Kids can enjoy hours of fun caring for their new pony and imagining racing through the fields as they rock on this gorgeous horse. This rocking horse is the perfect toy for developing balance and gros motor skills, and a firm favourite with kids. EU Warning: Not suitable for children under the age of 3 years due to small parts which could cause a choking hazard. Adult assembly required. Tighten all screws frequently. To be used under direct supervision of an adult.